In line with the celebration of Mother's day. 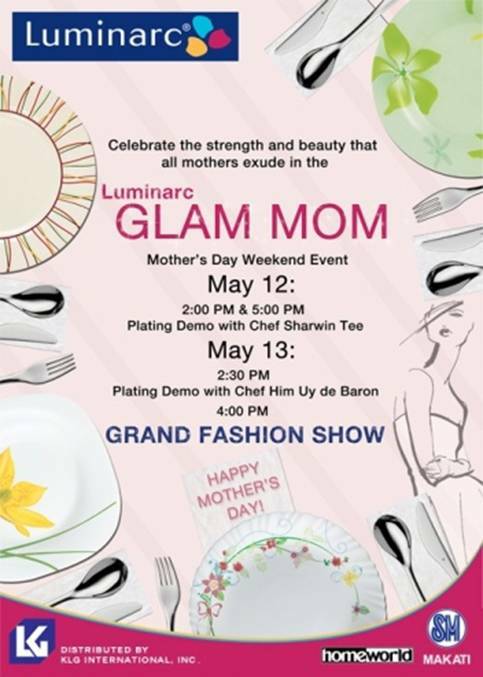 Luminarc, SM Makati, and Homeworld is inviting you all to celebrate with us on Luminarc Glam Mom Mother's Day Weekend Event happening this weekend. May 12, 2:00pm & 5:00pm - Plating Demo with Chef Sharwin Tee. May 13, 2:30pm - Plating Demo with Chef Him Uy de Baron. 4:00pm - Grand Fashion Show. This will held at the Concourse Area of SM Makati. 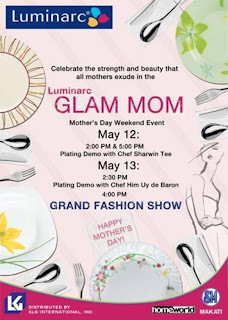 Expect the unexpected at this unique fashion show and see LUMINARC's latest tableware collections in a whole new light. Plus, enjoy free photobooth and get a chance to win amazing raffle prizes.